ROANOKE — Most all of us take pictures, but often don’t take time to make notes about the people or the subjects in them. For a company, historical photos are of little use if they’re not marked showing who or what is in the picture. Two Roanoke area retirees are volunteering their time these days to make sure the names and faces of the people who laid the foundation for today’s Appalachian Power aren’t forgotten. 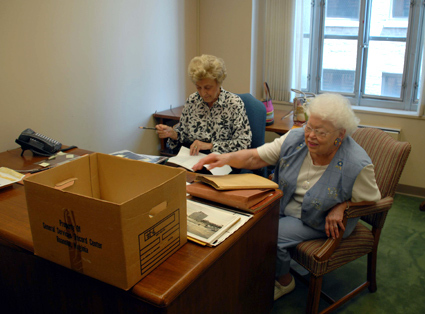 Rosemary Price (left) and Lorena Terry review old documents and photos from the Appalachian Power Company archives in Roanoke. Lorena Terry and Rosemary Price, members of the Roanoke area retirees association, have a combined total of 90 years of service with Appalachian. The two are identifying people and subjects of hundreds of historical photos and documents in the Roanoke office. The two are having a good time, too. “It’s a great trip down memory lane,” said Terry, whose career in Human Resources helps her readily recognize former employees. “It just brings back so many memories,” Price said, as she looked at a photo of her former desk at the entrance to the executive office where she worked as secretary to the company president. The local archives include photos reaching back into the early 1920s, and lots of construction photos of early power plants, transmission lines, distribution service, home economics programs that promoted electric appliances, buildings and company meetings and picnics. 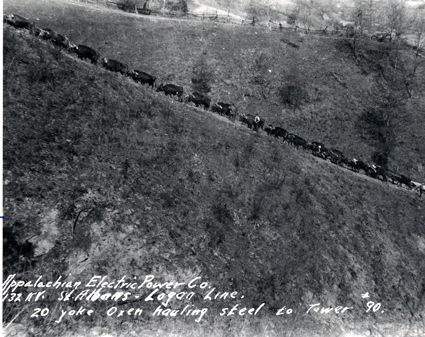 Here's an historical photo from Appalachian Power that is undated but does have some information -- the writing reads, "Appalachian Power Electric Co., 132 kV St. Albans - Logan Line; 20 yoke oxen hauling steel to Tower #90." To view a larger image, click on the photo above. “We’ve had several reorganizations in the last 15 years and a casualty of those reorganizations has been that a lot of company history has been lost,” said Todd Burns, corporate communications consultant.